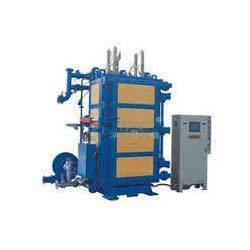 Being the leading names in the industry, we are providing an extensive gamut of Thermocol Manual Block Molding Machines. Specially designed for thermocol sheets, this machine is available in different specifications as per the needs of our clients. In order to manufacture this machine, our skilled professionals use high quality components and cutting-edge technology in accordance with set industry standard. M.K. Pattern & Engg. Works is one of the leading Manufacturers, Exporters and Suppliers of a wide variety of products such as Encapsulated Post Scripts Chinese Mould, Full Automatic Pre Expender Machine, SS Injector, etc. Incepted in the year 1994, the company's top-priority is to serve the requirements of the clients in the best possible manner and to provide them with unmatched quality products. Our firm has a state-of-the-art infrastructure unit, spreading across a vast area and is segmented into various units. Our manufacturing unit helps us in executing clients' bulk orders within the defined time frame. Each section is manned with adept team of professionals who have immense expertise in their respective domains. Moreover, our professionals work round the clock to meet the varied needs of the clients within promised time frame. With the help of our modern infrastructure and skilled team of professionals, we are able to undertake bulk and urgent orders of the clients in an efficient manner. With the help of our clients' centric approach and timely delivery, competitive pricing structure, we have garnered huge client base across the market.